Aliens Love Underpants - French & English / Les extra-terrestres adorent les slips is a bilingual story book with the full text featured in both English and French. This book can be used alone as a picture book, but it also has a very special added extra - if you own a PENpal Talking Pen, then you can download the audio for FREE and this becomes a talking book! Touch the corner of each page with the PENpal to hear a native speaker read the story to you, in French or English, so that you can perfect your pronunciation & intonation. 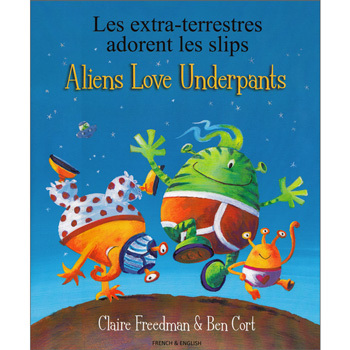 Aliens Love Underpants - French & English / Les extra-terrestres adorent les slips is a high-quality dual-language picture book, suitable both for children who are learning and reading French and English in parallel and those being introduced to French or English as a second language. The full text is featured in both English and French. A book that was very well liked by a newly 9 y.o. that appreciates the humour of underpants as children would where adults don't. Funny story, good text in both languages. Bilingual books like these help children who are already fluent in the one language, and only a starter in the other.